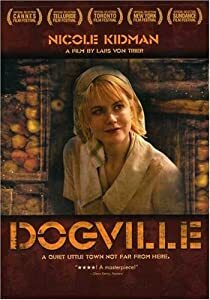 Dogville, starring Nicole Kidman and Paul Bettany, is absolutely the best theatrical presentation of the gospel I have ever seen. That is besides, of course, actual presentations of the gospel and Les Miserables. Okay, so it’s at least up there. This may be my new favorite movie (at least up there). To adequately give this movie the review and contemplation it deserves would require many thousands of words. I am not sure the intentions of the writer in this movie but it seems to be a deft parable illustrating the condition of man and the offer of grace. Sadly, it shows what happens when people deny they need grace and rather use grace to feed their own pleasure. The stylizing of this movie is quite provocative. And if you haven’t seen it, I’ll let you be surprised. For I am afraid that in the telling you’d be deterred from watching this masterful story. It is enough to say that this movie is told uniquely and appropriately in a way that is totally engaging and underlines the themes of the parable. That is not to mention the amazingly well-done performances given by everyone in the cast. Every character has depth and is illuminating. And even the kids (with lines) deliver convincing, realistic and weighty performances. A word of warning: This movie has a few non-gratuitous, yet somewhat graphic scenes. This, together with the subject matter, earns it’s R rating. 8 out of 5 stars! It was a good movie, different, yet profound.